The studio name Klactoveesedstene (Animations Ltd) was taken from the label of a Charlie Parker record. Why? You may ask. Well, why not! If you forget the name in full, Klacto has a memorable ring, as have the films they produce at this clean, efficient, thoroughly workmanlike studio. Ken Clark chats with Oscar Grillo and Ted Rockley. The young Oscar Grillo aged 17 (1961). 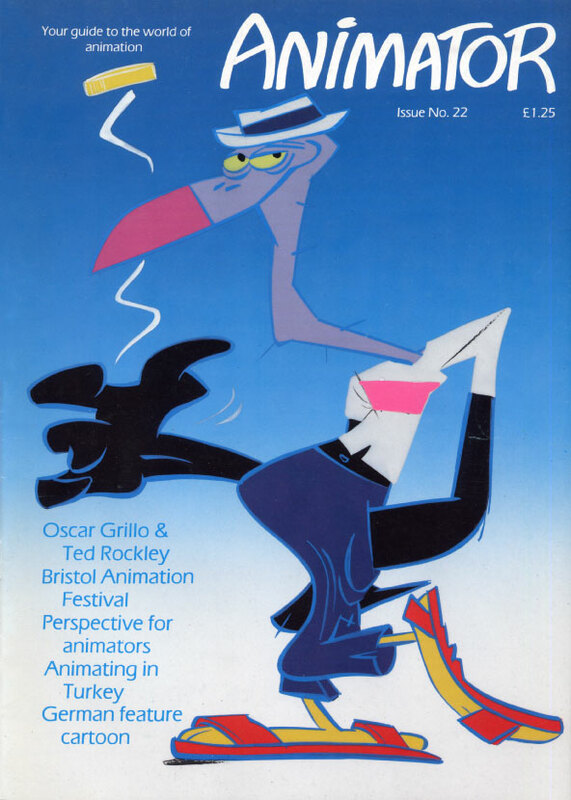 At the end of the day, having been given a free run of the studio and the opportunity of a chat with both Oscar Grillo and Ted Rockley, I had discovered a great deal about the two men and found myself re-assessing my own attitudes to life and to the profession. In the commercial animated film profession, a most necessary virtue is an ability to organise things, and the biggest hindrances to creativity are those people more interested in such aspects of production as expediency and playing political games between client and agency. The studio is expected to buzz with enthusiasm while suffering their constraints. It is rarely so black-and-white as receiving a brief and being told to get on with it; if anything, it is becoming more difficult by the minute. Oscar Grillo (left) with Ken Clark. Points of reference, these days, seem to be more confused than of old. New people entering the advertising business do not really know what it is all about. They have vague notions about how they want their commercials to appear, but their ideas are all too often based on their experience of seeing other people’s work on television. Their so-called originality springs from last week’s viewing and not from spontaneous creative inspiration, thus commercials are beginning to look more and more alike. The front cover features a character drawn by Oscar Grillo. Click the pic to see a larger version. In the Seventies there was a revival of animation on many levels. The “cartoon” style of the comic strip found expression in animation. For a time it met Oscar’s requirements, serving him well. While it is notoriously difficult to predict changing fashions, especially insofar as it affects commercial animation, there is always the other danger: it might become stereotyped. He believes the old style cartoon is on the wane. There are still a few stalwarts endeavouring to keep it alive, and here in England we have the best in the world, but it is beginning to lose its vitality. Youngsters coming into the profession from college do not show leanings towards that type of animation. During their schooling, emphasis is placed on expressions of formal art and not where it is most needed: on the stimulation of ideas related to the production of expressive kinetic art. He has seen miles of student show reels filled with ‘meaningful images’ which;, due to lack of experience of the medium are extraordinarily sterile. Oscar (left) with his teacher Carbos Garaycochea. He tends to be dismissive of festivals insisting that they project the idea of elitism in the profession even when there is a lack of perception inherent in individual productions. Films about misunderstood artists are generally made by artists who are misunderstood because they are unable to express themselves adequately. Festivals attract the committed and are rarely conceived with the general public in mind, which is very sad. The public are sensation seekers and would respond if given the opportunity.